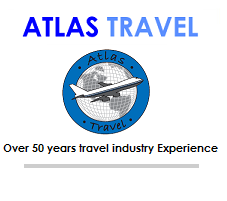 Atlas Travel full-service travel agency developed for the corporate, leisure and international traveler. We offer comprehensive corporate and vacation travel services. Atlas, has the capability of handling your every travel need. We will work with you to reduce your travel expenses and provide you with an enjoyable experience. There are travel agencies on every corner. What makes Atlas Travel, LLC. different from the rest? SERVICE! At Atlas you will be confident that, with one call, your travel plans will be handled accurately and professionally. We will use our extensive knowledge of the travel industry to ensure that every trip is arranged as completely as possible.